The success of Shawn Colvin’s A Few Small Repairs was a huge deal in Austin. Despite its billing as “The Live Music Capital of the World”, the Austin music scene didn’t have much of a national profile beyond music industry insiders. Seattle had its moment with grunge, and Prince was synonymous with Minneapolis. Austin had a statue to Stevie Ray Vaughan. 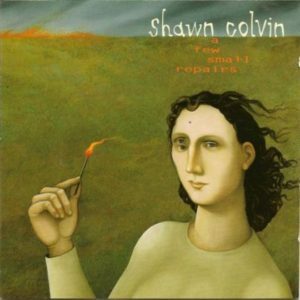 I had heard about Shawn Colvin before I moved to Austin in May 1997 — 20 years ago this month! — but I hadn’t heard any of her music. My parents still didn’t have cable television when I moved away, so tuning into MTV in the St. Edwards University apartments where the Austin American-Statesman housed its interns was pretty novel. That’s where I encountered the video for “Sunny Came Home.” The chorus of the song grabbed me, and of course, it was all over local radio. Before there was Kanye vs. Taylor Swift, P. Diddy infamously grabbed the mic from Colvin as she was accepting her Grammy award. The late ’90s were kind to the Austin music scene. Flush from the dot-com boom, transplants such as myself were eager to spend our cash, and the entertainment districts in Austin gladly took it. Beside the usual country acts, Austin supported singer-songwriters and indie rock bands. Colvin was the first to emerge nationally, followed a year later by Fastball. I hadn’t been to many concerts before moving to Austin, and it was the live music experience that made me realize gay bars weren’t really that much fun. A Few Small Repairs and my first summer in Austin are pretty much entwined. Then the economy tanked four years later, and A Few Small Repairs got traded for cash. My motivation for selling the album was based on the reason I bought it: peer pressure. I really hadn’t chosen to live in Austin — it was just the place that allowed me to leave Honolulu. By embracing the local music scene, I could embrace the city that was to become my home. The dot-com bust landed me a job at Waterloo Records, where I was subjected to music I just didn’t like. Up until then, I tried to be a cheerleader for everything new I encountered, but that experience made me realize I didn’t have to like everything. As money got tight, I couldn’t justify devoting shelf space to an album if I liked only one song on it, so A Few Small Repairs got purged. I was wrong, of course. A Few Small Repairs had more than one great song on it, as evidenced by “Get Out of This House”, the track following “Sunny Came Home”. “Wichita Skyline” and “Nothin’ On Me” provide further evidence. I did have the presence of mind to rip the album before I sold it, suspecting I was making a foolish decision, which I confirmed years later when I found that rip and listened to it. I wouldn’t welcome the album back into my collection till I found it at a book sale for the Friends of the Seattle Public Library.